Manchester United have received negative news regarding their pursuit of Napoli defender Kalidou Koulibaly. Earlier, reports had stated that Jose Mourinho, who is an admirer of the player, had asked the board to take keen interest in him. But the Italian outfit has rejected an £80m bid from the Mancunian club, according to a report in Football Italia. The Senegalese defender has earned a lot of reputation for his defensive duties, and is of interest to many European giants. With Mourinho seeking to fix the issues of his side’s defence, he may now have to look elsewhere. 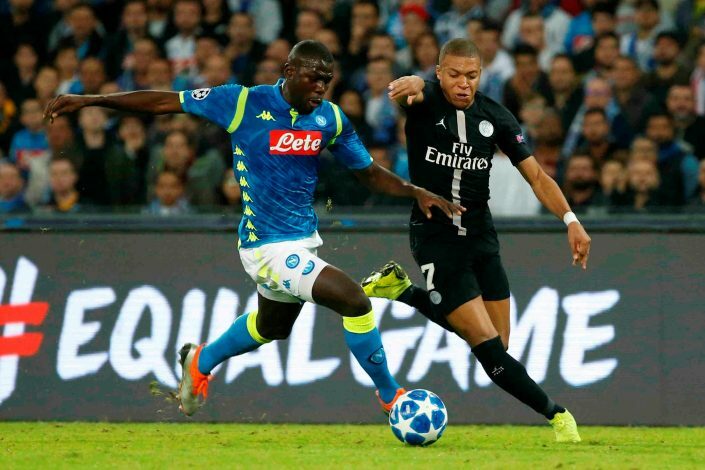 Koulibaly will fetch a huge sum, and although the Red Devils’ bid was in that region, Napoli are supposedly not satisfied with the offer placed on the table. It is understood that Napoli president Aurelio De Laurentiis is asking for upwards of £89m for the player. Koulibaly’s current contract shall keeps him at the Stadio San Paolo until June 2023. This means that Napoli have a strong hand in any kind of negotiations that take place for the talented Senegalese. The centre-back showed his worth when his side faced Paris Saint-Germain, as he successfully took on Kylian Mbappe, and never allowed the Frenchman any sort of a breather. The 27-year-old is also being monitored by the likes of Barcelona, Real Madrid, Manchester City, and Bayern Munich. It remains to be seen whether Manchester United go ahead and submit a better deal when the upcoming transfer window approaches closer.